The luxury motoryacht MUSTANG SALLY is available for either a Caribbean yacht charter in the fall and winter, or a Mediterranean yacht charter in the summer. Built by Trinity Yachts, MUSTANG SALLY adds a new dimension to the luxury charter market. 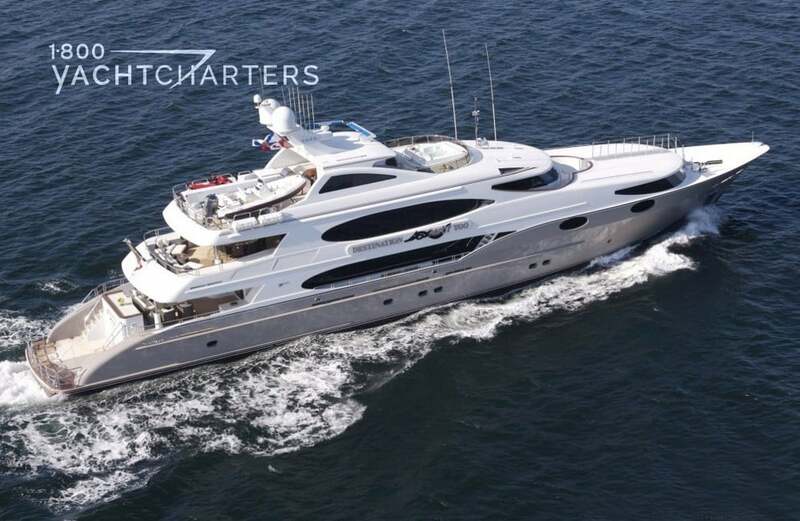 Clients seeking a Trinity yacht charter 1-800 Yacht Charters will be thrilled to find a new yacht with 5 luxurious staterooms plus an adaptable 6th stateroom to accommodate additional guests or act as a private office, gymnasium, or private lounge area. The Patrick Knowles Design interior of MUSTANG SALLY reflects a refreshingly cool style influenced by a European Spa Resort. The interior features tailored sophisticated fabrics, stonework showcasing Beaumaniere limestone, river rock pebbles, walnut Travertine, and satin nickel accents. The rich millwork is a palate of Redwood burl, Lacewood, Macassa ebony, and Honduran mahogany. Hand-carved glass panels inset into passage doors throughout, add a sense of art and dimension to her interior. A stunning mural on the forward bulkhead of the dining room provides a dramatic backdrop for the otherwise serene décor. Proceeding forward on the main deck of this megayacht, there is a grand entrance to the Master Stateroom. As you enter the Owner’s area, there is a private office to starboard with a queen size sleeper sofa, with private en-suite head and shower. Two stairs up to port, access the walk-around king bed facing forward with 180-degree panoramic views. The gentleman’s ensuite bathroom features a shower, toilet and sink and is situated to starboard. The lady’s bathroom is also ensuite and boasts a Jacuzzi tub, bidet, toilet, sink, and shower. The entertainment system consists of a 42” flat screen TV with DVD, individual satellite receiver, and surround sound. 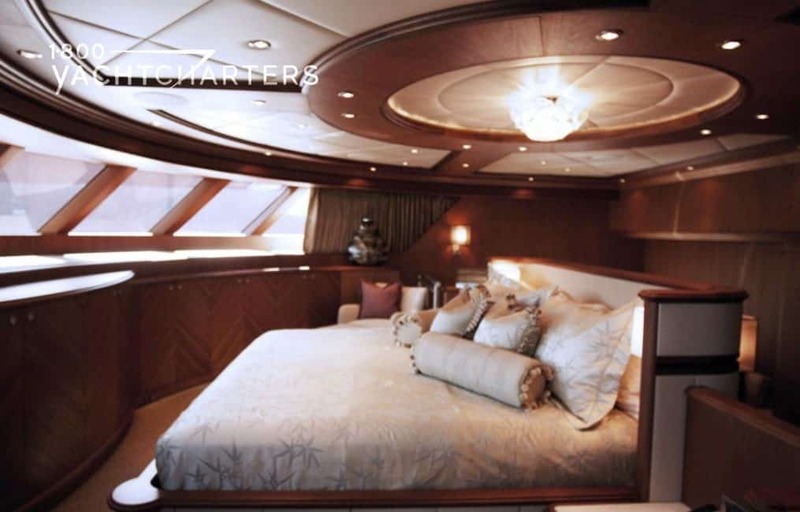 Upscale accommodations welcome charter guests to enjoy their luxury suites. Guest cabin number, located aft to port is a spacious stateroom with walk-around king size bed, 26 inch flat screen TV with DVD, individual satellite receiver, and surround sound. Ensuite features head, marble countertop with sink and spacious shower. Guest cabin number 2, located aft to starboard is a spacious stateroom with walk-around king-sized bed, 26 inch flat screen TV with DVD, individual satellite receiver, and surround sound. Ensuite features head, marble countertop with sink and spacious shower. Guest cabin number 3, located forward to port features: spacious stateroom with walk-around king size bed, 26 inch flat screen TV with DVD, individual satellite receiver, and surround sound. Ensuite features head, marble countertop with sink and spacious shower. Guest cabin number 4, located forward to starboard is a twin stateroom with one Pullman berth, featuring 26 inch flat screen TV with DVD, individual satellite receiver, and surround sound. Ensuite features head, marble countertop with sink and spacious shower. State of the art electronics are available throughout this mega yacht and include V-SAT constant Wi-Fi internet, Crestron video and audio equipment, flat screen TV’s with individual satellite receivers, surround sound, and iPod docking stations. This luxury motoryacht is also environment friendly, equipped with an ozone-based water treatment system. For the restless, MUSTANG SALLY carries an assortment of toys including a 19 foot Nautica tender, 2 waverunners, snorkel gear, water skis and towables. Exercise buffs will enjoy the rowing machine, recumbent bicycle, and an ondeck Jacuzzi to relax in after playtime! 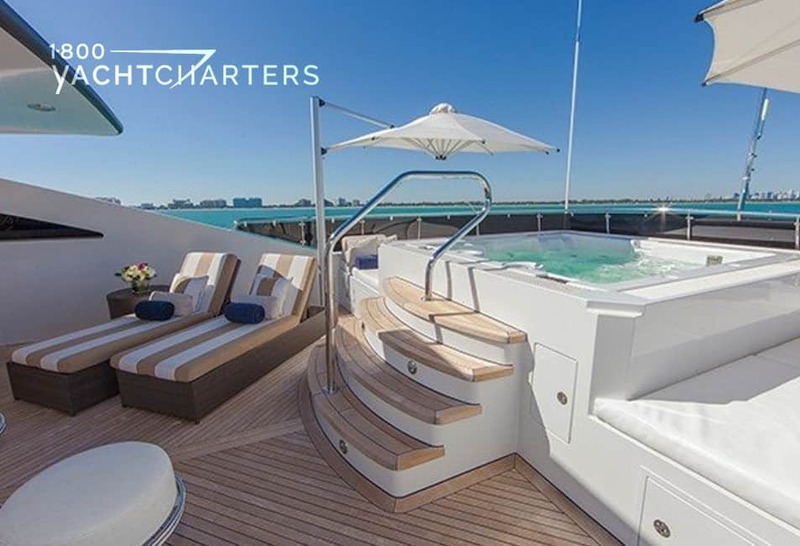 For a luxury yacht charter, this superyacht can accommodate 10 to 12 guests in 5 to 6 staterooms, depending on the charter party’s requirements. A professional crew of 10 is onboard to cater to the charter guests, and includes a captain, an engineer, a gourmet chef, a lead hostess, and several deckhands.